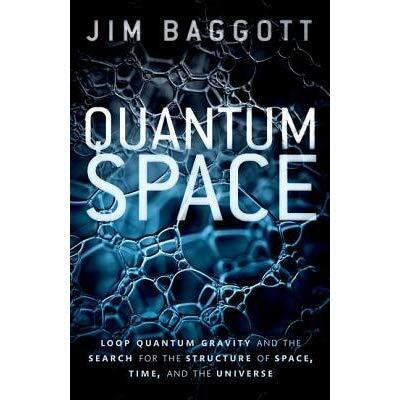 In his new book Quantum Space, Jim Baggott presents Loop Quantum Gravity (LQG) as the overlooked competitor of String Theory. He uses a chronological narrative that follows the lives of Lee Smolin and Carlo Rovelli. The book begins with their nascent interest in quantum gravity, continues with their formal education, their later collaboration, and, in the final chapters, follows them as their ways separate. Along with the personal stories, Baggott introduces background knowledge and lays out the scientific work. Quantum Space is structured into three parts. The first part covers the basics necessary to understand the key ideas of Loop Quantum Gravity. Here, Baggott goes through the essentials of special relativity, general relativity, quantum mechanics, quantum field theory, and the standard model of particle physics. The second part lays out the development of Loop Quantum Gravity and the main features of the theory, notably the emphasis on background independence. The third part is about recent applications, such as the graviton propagator, the calculation of black hole entropy, and the removal of the big bang singularity. You also find there Sundance Bilson-Thompson’s idea that elementary particles are braids in the spin-foam. In this last part, Baggott further includes Rovelli’s and Smolin’s ideas about the foundations of quantum mechanics, as well as Rovelli and Vidotto’s Planck Stars, and Smolin’s ideas about the reality of time and cosmological natural selection. The book’s epilogue is an extended Q&A with Smolin and Rovelli and ends with mentioning the connections between String Theory and Loop Quantum Gravity (which I wrote about here). Baggott writes very well and he expresses himself clearly, aided by about two dozen figures and a glossary. The book, however, requires some tolerance for technical terminology. While Baggott does an admirable job explaining advanced physics – such as Wilson loops, parallel transport, spinfoam, and renormalizability – and does not shy away from complex topics – such as the fermion doubling problem, the Wheeler-De-Witt equation, Shannon entropy, or extremal black holes – for a reader without prior knowledge in the field, this may be tough going. I’d have some other minor points to quibble with, but given the enormous breadth of topics covered, I think Baggott’s blunders are few and sparse. I must admit, however, that the structure of the book did not make a lot of sense to me. Baggott introduces a lot of topics that he later does not need and whose relevance to LQG escapes me. For example, he goes on about the standard model and the Higgs-mechanism in particular, but that doesn’t play any role later. He also spends quite some time on the interpretation of quantum mechanics, which isn’t actually necessary to understand Loop Quantum Gravity. I also don’t see what Lee Smolin’s cosmological natural selection has to do with anything. But these are stylistic issues. The bigger issue I have with the book is that Baggott is as uncritical of Loop Quantum Gravity as he is critical of String Theory. There is not a mention in the book about the problem of recovering local Lorentz-invariance, an issue that has greatly bothered both Joe Polchinski and Jorge Pullin. Baggott presents Loop Quantum Cosmology (the LQG-based approach to understand the early universe) as testable but forgets to note that the predictions depend on an adjustable parameter, and also, it would be extremely hard to tell apart the LQG-based models from other models. And he does not, in balance, mention String Cosmology. He does not mention the problem with the supposed derivation of the black hole entropy by Bianchi and he does not mention the problems with Planck stars. And if he had done a little digging, he’d have noticed that the group-think in LQG is as bad as it is in string theory. In summary, Quantum Space is an excellent, non-technical, introduction to Loop Quantum Gravity that is chock-full with knowledge. It will, however, give you a rather uncritical view of the field. * I explained here why the non-discovery of supersymmetric particles at the LHC has no relevance for string theory. - Why does Baggott has to talk about string cosmology in this book? Does it help to understand fundamental cosmology? Does it help to understand loop cosmology? Is there any positive result one should compare with? I'm referring to this. Baggott writes quite a lot about string theory, but only mentions its problems. Then, when it comes to phenomenology, he forgets to say anything about string theory. Now, it would have been fine with me had he said nothing about string theory to begin with and just stuck with LQG, but the way he chose to present it strikes me as unfair. "removal of the big bang singularity" Physics suffers singularities, infinities, and absence of S_n symmetries (geometric chirality). It denies, writes math, then parameterizes versus observation. … Group theory says, "Tully-Fisher is not dark matter." … Ten black holes’ gravitational wave ringdowns deny interior content being center-of-mass lopsided immediately after merging. Binding energy emission suggests two empty bubbles popping into one. Beginning a model with "ignore noisome footnotes for clean math" guarantees "more studies are needed." Loopy, indeed. I love the idea of background independence and granular, discretized spacetime that LQG espouses. But the idea is burdened by the constraints in the Hamiltonian formalism (which I can't follow) and not Lagrangian formalism (which I can), while the Ashtekar variables used in the theory are completely incomprehensible to me. Even so, LQG sounds a lot better than string theory. can you upload videos on youtube on pros and cons of Loop Quantum Gravity, Loop Quantum Cosmology , spin-form, and Loop Quantum Gravity-string theory mergers? the only other Loop Quantum Gravity done by a physicist thus far on youtbe is by don lincoln fermilabs. 1. Extrapolation of known physics to much smaller scales. Take Maxwell's equations in vacuum as an example. All he knew was certain relations between the electric and magnetic fields, experimentally deduced by Faraday on scales on the order of a centimeter. Extrapolating these relations to the scale describing the propagation of light, would have required a gigantic leap of faith had it not been for the fact that those relations turned out to be scale covariant. Before attempting to extrapolate the little we know about physics to ridiculously small scales, physics must first be formulated in a scale covarinat way, whereby any privileged scale emerges as an attribute of a specific solution rather than being introduced as a fixed parameter (just like a privileged position emerges in translation covariant theories). This is not the case. 2. Attributing autonomous status to spacetime is poetry, not physics. All we can know about space and time comes from the properties of matter; matter composing (generalized) clocks and rulers. The notion of space and time then emerge as inevitable corollaries of properly representing matter. Our current representation of matter, besides not being scale covariant, is plagued by the conceptual vagueness of QM. It seems to me there are several possible reasons why Baggott is so kind to LQG: maybe he believes it is the correct approach, maybe "the enemy of my enemy is my friend," also the dedication "To Carlo and Lee For entrusting me with your stories," or not. I never understood how black hole entropy can be calculated in LQG considering that the Schwarzschild metric is not even a solution of LQG. From what I understand they assume that they have a black hole solution. Then they assume that this solution has a horizon and that the number of degrees of freedom is related the area of this horizon. Then they go through some complicated math to count how many loops are needed to cover this horizon and surprisingly find that it scales linearly with the area of the horizon. They cannot even get the linear coefficient right (since it depends on the Barbero-Immirzi parameter). Anyone that claims that black hole entropy can be calculated in LQG is either ignorant or dishonest. String theory has lots of structure, and some of it may end up playing a role in physics. What is remarkable is that the bosonic string is in 26 dimensions, and this is also the size of the space of the Jordan 3x3 matrix systems of three e8's. This has the automorphism of the Monster or Fischer-Griess group, where of course that takes one into some deep math. How all of this stringy structure enters into what we may come in the future to regard as quantum gravity is not clear. Loop Quantum Gravity is based on the Wheeler-DeWitt equation and Ashtekar's spinor variables. There is nothing outright unreasonable about this. However, the Wheeler-DeWitt equation is based on a constraint condition in ADM relativity. As such it should always be remembered this theory is really framed around a constraint more than dynamics. I cringe any more when I hear the term spin foams. Data from distant burstars indicates there is no dispersion induced on photons by spin foams. These results of last decade to my reckoning brings some hard questions about the reality of this. Space appears to be continuous down to scales far smaller than the Planck length. Further, recent LIGO data indicates there is no leaking of gravitation due to extra large dimensions, and in fact this applies to small dimensions. This puts much of the string work on Calabi-Yau manifolds and wrapping of D-branes in trouble. I think spacetime is emergent from entanglement symmetries, and the whole notion of it being built up from either little plaquettes in spin foam or the result of some weak gravity with compactified manifolds and wrapped branes might both be wrong. 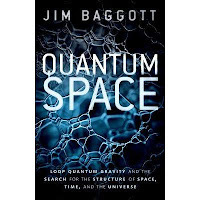 I found Baggott's book Quantum Space to be scattered and lacking continuity. Perhaps my opinion is extra critical because this is my first exposure to loop quantum gravity I found LQG to be greatly disappointing nonsense. Does it touch at all on the idea about how, with distant light sources, photons could take different paths through the LQG mesh and show slightly different arrival times? The idea was proposed some times ago, and I've always wondered what resulted. Baggott is reffering specifically to Bianchi's calculation, which I commented on here. The brief summary (for what I recall) is that he circumvents these problems by not calculating the microscopic degrees of freedom in the first place but (in essence) calculating a spin-foam version of the Unruh-effect and then using the equivalence principle and the Clausius relation. Fwiw, they seem to have given up the idea that LQG leads to deviations from Lorentz-invariance and hence modified dispersion relations. That it fit badly with the data probably had something to do with it.
" Further, recent LIGO data indicates there is no leaking of gravitation due to extra large dimensions, and in fact this applies to small dimensions. This puts much of the string work on Calabi-Yau manifolds and wrapping of D-branes in trouble." No, the book does not mention deviations from Lorentz-invariance or the predictions you mention, which largely have fallen out of favor. It briefly comes up, or so I think, in the Q&A where Smolin explains why, ten years ago, he was more optimistic about the prospects of figuring out what's the right theory of quantum gravity. But it's not expanded upon. Thanks for catching that, I've fixed it. SH wrote No, it does not because there's no particular reason those extra dimensions need to be large. The only reason physicist thought this would be the case is naturalness. I think the idea of large dimensions was in part a sort of desperation. The idea was that maybe there is some prospect for quantum gravity or supergravity at TeV energy. The result from LIGO that over rule extra large dimensions may be refined in the future, and I suspect we may find there are no extra dimensions curled up period. In fact the FERMI and INTEGRAL measurements of distant burstars may suggest this as well; there are no small distances where fields interact with some dispersion. It might be that Kaluza-Klein is a gadget that is not entirely right, where curled up spaces are taken to zero scale limit. This might then mean some sort of renormalization scheme is needed, such as p-adic fields. "The idea was that maybe there is some prospect for quantum gravity or supergravity at TeV energy." Yes, and the argument for this was naturalness. As I already told you. If you don't believe it, look up the literature. Or read this, or read my book, I have further references in there. "Baggott is reffering specifically to Bianchi's calculation, which I commented on here. The brief summary (for what I recall) is that he circumvents these problems by not calculating the microscopic degrees of freedom in the first place"
If LQG is not counting the microscopic degrees of freedom then what the point? At most LQG is reproducing the semi classical results. "We consider non-extremal Black Holes of the Kerr-Newman family." These metrics are not a solution of LQG. I am not aware of any black hole solutions in LQG. Someone should find such solutions before making any claims about the entropy of these solutions. One might claim that he is doing the calculation in the background of a classical solution, but LQG people insist that LQG is background independent and that choosing an approximate background is not allowed. your review passes over the question as to who is its intended audience? it can't be a person who doesn't understand "braids in the spin-foam." despite the author's 'attempt' to explain it. Einstein;s book popularizing his work on relativity was, i think, quite accessible to the public. but after reading "Quantum Space" i recalled the BBC interview with a mathematician in which, when asked "Can you explain Wiles proof of Fermat's Last Theorem in layman's terms?" replied succinctly "No" and Feynman's comment on his Nobel Prize winning research ""If I could explain it to the average person, it wouldn't have been worth the Nobel Prize." Has research on foundational physics become inherently incomprehensible to the non-specialist and if so, is it due to the mathematics or the physical ideas? "Einstein;s book popularizing his work on relativity was, i think, quite accessible to the public." In a pun which doesn't translate directly, Einstein once remarked that, instead of gemeinverständlich, his book was gemeinunverständlich. you seem to be in a rather bad mood "how am i supposed to know...". i wasn't asking what the author was intending; i was asking who you thought the book would be suitable for. that's what i thought book reviews were supposed to mention. after all why do publishers send people free review copies of a book - because they like them or in hope of promoting sales of the book? I am not in a bad mood, I merely tried to answer the question that you asked. Now you are asking a different question. I think the book may be suitable for students who want to get a sense of what lqg is all about and for interested non-experts who want to see how lqg holds up against string theory. Though, as I mentioned, the book requires the reader to cope with quite a lot of technical detail. Realistically, I think someone who has not at least read several other popular science books about gr, cosmology, quantum mechanics, and qft will get lost already in the first chapters. Vaguely speaking, I think it would be a good match for most people who read this blog. As I'm sure all are aware, I have been "notably absent" for a couple of days due to the fact that my "internet" was hauled off with a load of hurricane debris. Someone in the neighborhood... likely a physicist or other wealthy person who lives across the street on the lakefront... decided it was a good idea to make a debris pile on top of our local telecommunication junction box. The crews came along to scoop up and truck away the load, and... well, lots of wires are sticking out of the ground. This is a bigger problem than it might seem, not only because I was told it will take a week for the repair, but also because I depend on the web for my very survival. Not a good idea, I know, but, when the World comes to an End, I'll just have to come up with another means to get by. Meanwhile, I'll at least provide a link to a free (albeit only 1200 pages) astronomy textbook I've come across, for anyone who is interested. It can be downloaded in PDF format, and is available for Kindle on multiple devices as well. Looks to me like this will be the one to take the place of my vintage Abell's Exploration Of The Universe.